I’ve finally found time to read Geoffrey de Mandeville and London's Camelot, about ghosts, historical mysteries and the occult in Barnet - in which a photo I took has been published. Not only was I delighted to see one of my pictures in print, I enjoyed reading the book very much indeed. 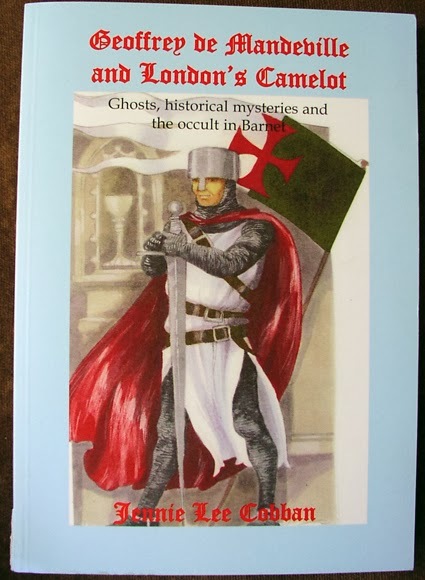 Geoffrey de Mandeville and London's Camelot is by archaeologist and historian Jennie Lee Cobban, who says in her introduction: "Ever since I can remember I have been interested in two rather disparate subjects: archaeology and the world of the supernatural." Jennie is also interested in witches. One of her earlier books is The Lure of the Lancashire Witches, about the Pendle witches who lived not far from the village Jennie herself was born in. As an adult, she moved to Barnet, in North London, and says: "I was delighted to discover that the area was a rich storehouse of ghost lore, legend and archaeological puzzle." That is the basis of Geoffrey de Mandeville and London's Camelot. My own interest in the area came as part of a Grail quest and a visit to a potential site of King Arthur's legendary castle of Camelot. I went to Camlet Moat, in Trent Park, which is called Camelot on some old maps, around the time of the Winter Solstice 2012 and took photos of the area. After writing about it on my blog, Jennie asked me if she could use one of my photos in the new and updated edition of her book on London's Camelot (the first edition is out of print and hard to find). Trent Park is also said to be haunted, both by the owner of the former hunting grounds, Geoffrey de Mandeville, and by a mysterious lady who some associate with the Goddess. But Geoffrey de Mandeville and London's Camelot isn’t only about Arthurian legends and ghostly knights. The book also has quite a bit about witches. As anyone who has studied the history of Wicca will know, Gerald Gardner’s Bricket Wood coven met and circled in a real witch’s cottage. But, before Gerald moved the timber framed thatched cottage to St Albans, it had been rescued from demolition and was one of the exhibits in a folklore museum in North London. Jennie also writes about some historic witch trials in the area – including one woman accused of witchcraft who managed a jail break to try to escape her persecutors. I could go on – the book is packed with intriguing mysteries and colourful characters – but the best way to find out all about them is to read the book yourself. Jennie’s writing style is thoroughly entertaining and full of dry humour, while those who are sticklers for factual accuracy will love all the fascinating historical evidence she has painstakingly researched. You can buy copies of the new edition of Geoffrey de Mandeville and London's Camelot from Barnet Museum. Jennie's other books, including The Lure of the Lancashire Witches and 800 years of Barnet Market can be ordered via Amazon. I read that Pendle Witches book and it was long but good and detailed. Yes our gramma witch Sybil hung out around there too.